The first plan dates from 1839 but the work on the building’s structure was conducted between 1841 and 1865, and the interior ornamentation, from 1876 to 1885. Missionaries on temporary postings initiated the actual construction. The original church was designed by local builder Antoine Robillard and a Father Cannon who requested a Neo-classical design. However, in 1844, after the lower section was completed, the Oblate Fathers took over the parish and Father Telmon was sent from France to finish the construction. Father Telmon decided to redesign it to be a more standard Neo-Gothic structure, a style which was growing in popularity. This left the lower features, such as the main entrance, Neo-Classical, while the rest is Neo-Gothic. The main structure was finished in 1846, but it was not until 1866 that the spires were installed. The steeples are topped with standard French-Canadian tin and bells. Its exterior is fairly reserved, but the interior is as far more ornate, designed by Georges Buillon. The interior of the church is brightly painted and decorated with carved features, exquisite stained glass windows and hundreds of statues of various religious figures. 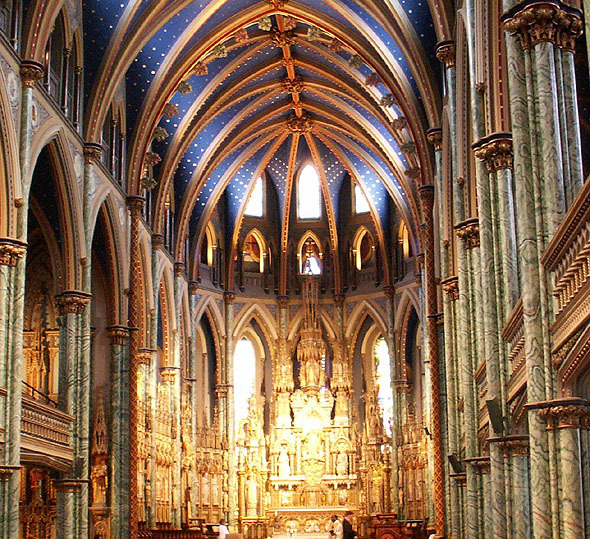 Louis-Philippe Hébert completed thirty large wooden sculptures in the choir.